ShuarHands, Inc. is pleased to work in cooperation with Niños Shecanos, a non-profit Guatemalan organization,to provide the opportunity for Child Sponsorship. Through letters, pictures and occasional gifts, you will come to know about your sponsored child’s family, community, daily routine and his or her hopes for the future. These connections give children hope, make them feel nurtured and provide the confidence they might otherwise lack. Sponsor a child through ShuarHands, Inc. and you will build a personal, one-to-one relationship with your sponsored child. Of the 174 nations analyzed by the UN in 2000, Guatemala ranked 124 in development. Approximately 57% of the families are poor and 27% are living in extreme poverty (less than $1.00 per day). Your sponsored child of Mam origin resides in the rural area of the Department of San Marcos. When you sponsor a child, we will combine your donation with donations from other sponsors to support community-wide programs. Your donation will offer vocational skills, provide health care and establish renewable sources of food and safe water. Emergency assistance to children and their families who are victims of natural disaster will also be provided. Educational programs focusing on health hazards and child protection issues will be given. We also assist parents in parenting issues, nutritional awareness, legal rights, in an effort to better support their families. Together, we can help plant the seeds of self-sufficiency. Fill out the application form. Choose to sponsor a boy or girl. 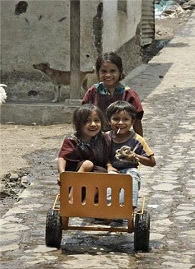 ShuarHands, Inc. will send your sponsorship contribution of $240 per year directly to Niños Shecanos to provide your sponsored child with what he or she needs to grow healthy and thrive: education, nourishing meals, clean water, medical care and opportunities to play, develop and learn. You will receive information about available children via email within 3 weeks. You then select your “Child”. Your yearly gift will be combined with those of other sponsors whose children are enrolled in the same area, so that all girls and boys will benefit. You will receive correspondence with your child through letters and pictures. You are not required to write, but hearing from sponsors is very meaningful to the sponsored children. Visits are encouraged! ShuarHands, Inc. staff will arrange a visit for you to meet your “Child “and his or her family. We’ll also accompany you, if you wish. For more information, please contact Bette Palovchik at 619-478-2642. NOTE: Your donation is tax deductible. ShuarHands, Inc. is a 501c3 non-profit organization. Please visit our website at www.shuarhands.com for information about our mission and goals.